Get Answers to Any Last Minute Tax Questions from Contributing Editor of "J.K. Lasser's Your Income Tax 2012: For Preparing Your 2011 Tax Return"
Tips for preparing your 2011 income tax returns available now. With the deadline to file taxes fast approaching, get answers to any top tax questions from Barbara Weltman, Tax Expert and Contributing Editor of "J.K. Lasser's Your Income Tax 2012: For Preparing Your 2011 Tax Return." In this month’s advice-filled videos, Barbara Weltman discusses moving costs and multi-state income, home sales, how to estimate tax costs if you’re an independent contractor, claiming a parent as a dependent, childcare expenses and much more. 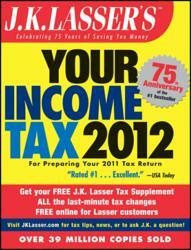 Please visit the website below for these tax tips: http://www.jklasser.com/page_tags/video/. "J.K. Lasser's Your Income Tax 2012: For Preparing Your 2011 Tax Return"
Barbara Weltman, J.K. Lasser’s spokesperson, is an experienced media professional, ready to lend her expertise to print, online, and broadcast segments. Barbara was recently named among the List of 100 Small Business Influencers for 2011, among many other major honors. She also hosts the radio show “Build Your Business” on http://www.wsradio.com. She is a key member of the J.K. Lasser Institute team of editors & writers, and has contributed to dozens of best-selling business books. Answers the most common question in tax, "what can I deduct?" in easy to understand language. A must have book for every taxpayer. This book provides the tax facts, strategies, and latest up-to-date information that a small business owner needs to maximize deductions and reduce payments to the minimum. J.K. Lasser Institute has been the premier publisher of consumer tax guides since 1939, when Jacob Kay Lasser first published Your Income Tax. Since then, the guide has been published continuously for over seventy years and read by over 39,000,000 people. The J.K. Lasser Institute also publishes several personal finance books, including Small Business Taxes, Home Owner's Tax Breaks, 1001 Deductions and Tax Breaks, Year-Round Tax Planning, and more. J.K. Lasser Institute spokespeople are regularly sought after as media tax experts. They regularly appear on such broadcast programs as CNBC, CNN, and Bloomberg TV. They are also often featured in numerous periodicals, including The Wall Street Journal, USA Today, Self Magazine, The New York Times, Newsweek and Reader's Digest.